Rep. Laura Richardson (D-CA), the target of attack ads by Americans for Ethical Leadership. There's been a lot of talk this election about groups, like the Karl Rove-backed American Crossroads GPS, that take big donations to fund attack ads but, under the tax code, do not reveal their contributors. But there's another way to keep donors anonymous -- at least until after election day, when their identities no longer matter as much. Here's how it works: normally, groups like Americans for Ethical Leadership do have to reveal donor information to the FEC and the public. But the last deadline for filing donor information before the election (the so-called "pre-general" report) is Oct. 21. Americans for Ethical Leadership wasn't created until Oct. 25, four days after that filing deadline and just a week before voters go to the polls. So we won't know who is funding the group until the December "post-general" report, when the public and the press won't be paying attention. There are, however, some clues as to who is behind Americans for Ethical Leadership. Its treasurer is Dana W. Reed, an Orange County election lawyer and longtime GOP activist. And it shares a Los Angeles address with Reed's firm, Reed & Davidson. 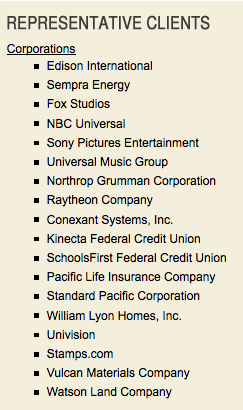 The firm's client list (see below) includes many major corporations. Could one of these be angry at Richardson? We won't know for sure until after the election.